Reference: Zizic TM, Hoffman KC, et al. “Treatment of Osteoarthritis of the Knee with Pulsed Electrical Stimulation”. 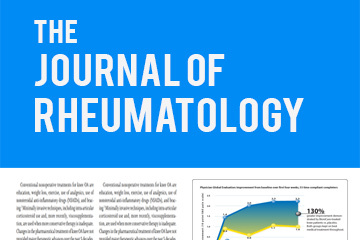 Journal of Rheumatology 1995, Vol 22 Issue 9, Pages 1757-1761. A university-based multicenter, prospective, randomized, placebo-controlled clinical study was conducted to evaluate the safety and efficacy of the BioniCare Knee Device in the management of osteoarthritis. 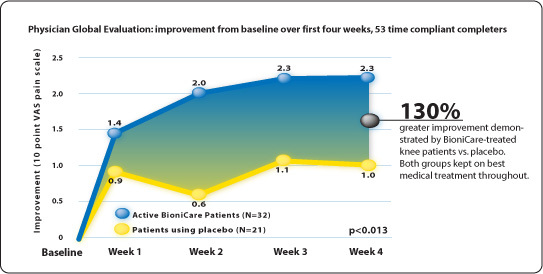 Patients were maintained on NSAID and/or analgesic therapy throughout the study and were randomly assigned use of an active or inactive (placebo) BioniCare Knee Device for four weeks. 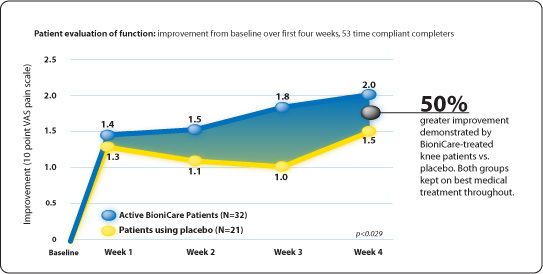 Pain relief with the BioniCare Knee Device was significantly greater than with NSAID therapy and/or analgesics alone. 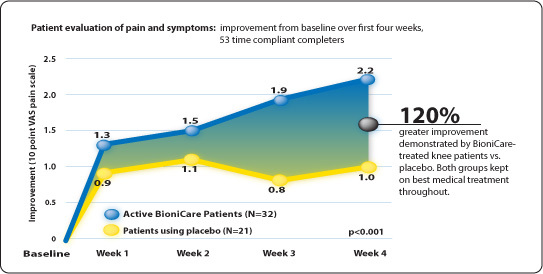 BioniCare treated patients showed 130% improvement over placebo in the Physician Global Evaluation, a 120% improvement over placebo in the Patient’s Evaluation of Pain and Symptoms, and a 50% improvement over placebo in Patient’s Evaluation of Function. A total of 78 patients were treated at five University Centers: University of Connecticut, Case Western Reserve, Johns Hopkins, University of Nebraska and the Nebraska V.A.